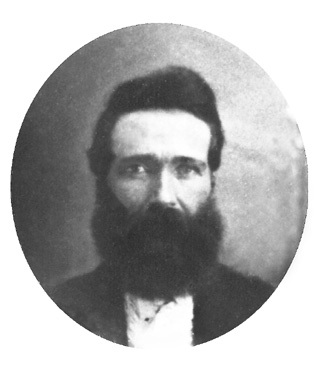 Jacob Ragle was born September 22, 1833 in Orange County, Indiana, to Peter and Margaret Wadsworth Ragle. Jacob was a resident of Loogootee, Martin County, Indiana, when he was commissioned as a Captain by Indiana Governor Oliver P. Morton on August 3, 1862. The unit Jacob helped raise became Company K ("The White River Rangers") of the 80th Indiana. Jacob's brothers, 2nd Sergeant Alonzo O. Ragle and Private Nathan Ragle, also served in Co. K. Captain Ragle was honorably discharged from the Army on October 27, 1864, due to disabilities. Jacob was married to Samantha Keck and they had 8 children. Jacob and Samantha died of tuberculosis (TB); she on January 19, 1873, and he on February 17, 1877. They are buried in the Raglesville Cemetery. The original image is believed to have been taken sometime after the end of the American Civil War (1861-1865). However, the copy on the right was found pasted to a post-war poster of Co. K. The poster belongs to Capt. Ragle's Great Great Grandson Richard Logan Ragle and was provided by 2nd Sergt. Ragle's Great Grandson John Ragle. All Rights Reserved. Created November 26, 2002. Last updated December 1, 2002.